The Russian Imperial Movement (RIM), a St. Petersburg-based group, contacted organizers of the deadly 2017 Unite the Right rally in Charlottesville, Va., and suggested members of American white nationalist groups travel to Russia for a paramilitary training course called Partisan, according to U.S. officials. Officials familiar with intelligence reports provided no other details of the intelligence and both the Russian group and some American white supremacists involved with Charlottesville denied accepting the training offer. Partisan provides military-style training for what the group believes is a period of forthcoming "global chaos." The course was blamed for radicalizing three Swedish right-wing activists convicted in 2017 of several bombings in Sweden. RIM would not say if paramilitary training was offered to U.S. alt-right activists but did say none had taken the course. "The course Partisan is open to all," the group said in a statement. "But none of the American alt-right or other activists participated in it." The FBI information is an indication of Russian efforts to back right-wing extremists in the United States, and could trigger further FBI counterintelligence or counterterrorism investigations into the activities of American white supremacists. FBI spokesman Brian Hale declined to comment. Jason Kessler, a main organizer of the Charlottesville rally, did not respond when asked in a text message about his contacts with the Russian Imperial Movement and its offer of training. Eli Mosley, former head of the white nationalist group Identity Evropa, and Richard Spencer, head of the National Policy Institute, both organizers of the Charlottesville rally, did not return phone calls or emails seeking comment. The white nationalists in Charlottesville chanted "Jews will not replace us," "blood and soil," and "this is our town now," according to a federal lawsuit filed against the organizers of the August 2017 rally. One of those named in the civil lawsuit, Matthew Heimbach, a former head of the now defunct neo-Nazi group Traditionalist Worker Party, said he never engaged in RIM paramilitary training nor to his knowledge did other Americans. "I have hosted several representatives from RIM over the years and networked extensively during my trips to Europe," Heimbach said in an email. Heimbach was among a group of white nationalists and neo-Nazis who organized and took part in a May 13, 2017, rally in Charlottesville where scores of protesters chanted "Russia is our friend," among other chants. In an interview, Heimbach did not say if RIM offered Partisan training. "I've never been involved in their paramilitary activities," he said. "For us, the relationship has been to share political ideas." As for the FBI probing alt-right groups, Heimbach said "I do think the idea of a working political relationship between American nationalists and Russian nationalists would honestly frighten the FBI more than training with guns. Ideas are more dangerous." Links between U.S. alt-right figures and RIM do not appear directly related to Russian intelligence operations targeting the 2016 and 2018 elections. An FBI complaint in the case of a Russian influence operative, Elena Alekseevna Khusyaynova, stated that Moscow is working to sow political unrest through social media by exploiting specific events, including the Charlottesville Unite the Right rally and associated violence. Khusyayova, an accountant with the St. Petersburg-based troll farm Internet Research Agency, was charged in October with conspiracy to influence elections in 2016 and 2018. Five people involved in the Unite the Right rally in August 2017 were identified by their Twitter handles in an internal "general orders" document produced as a guide for rally participants. "We are expecting to have a large number of friendly people attend this rally ranging from Alt-Lite, Oath keepers, Proud Boys, and Trumpists to Identitarians, Neo Confederates, national socialists and other Alt Right groups," the document states. "It is important that every group regardless of ideological differences work together at the event." The document said information updates for the rally would be sent on Twitter through the accounts of Kessler, Spencer, Mosley, A. Wyatt Mann, Hunter Wallace, and Michael Peinovich. Peinovich said in an email he "never heard" of RIM. Other Charlottesville rally organizers could not be reached for comment. Mosley, who changed his name from Elliott Kline, told the New York Times in 2018 that after Spencer was videotaped being blindsided with a punch to the head during a street interview in Washington, said "I need to meet up with Richard and make sure that doesn't happen again." "That's kinda when I knew I had to get serious and I knew we had to professionalize," Mosley said. RIM activities in Europe were disclosed through the case of three right-wing activists in Sweden—Viktor Melin, Jimmy Jonasson, and Anton Thulin—who were convicted of carrying out a series of bombings in 2017. All three were linked to a neo-Nazi group called the Nordic Resistance Movement. Swedish security police who investigated the case found that Melin and Thulin had traveled to St. Petersburg several months before the bombings in late 2016 and received paramilitary training in the Partisan course. Swedish Prosecutor Mats Ljungqvist told reporters after the 2017 conviction that the Partisan training and messages sent between the men revealed they were radicalized during training in Russia. "Attending this paramilitary camp in St. Petersburg was a key step in Melin and Thulin's radicalization," Ljungqvist told the Daily Beast. "We also believe it may be the place where they learned to manufacture the bombs that they used in Gothenburg." RIM is one of a number of non-government groups linked to Russian intelligence agencies. The group has been active in supporting pro-Russian separatists in Ukraine. "The RIM is not an ordinary far right organization, but a fascist paramilitary movement that poses a potential terrorist threat to democratic societies," said Ukrainian political activist Anton Shekhovtsov, who monitors radical rightist groups. RIM was first set up in 2002 by Stanislav Vorobyov and claims to seek a revival of the Russian Empire and restoration of the monarchy. The 2017 Charlottesville rally, Unite the Right, brought together white supremacists that turned violent when one protester rammed his car into a group of leftist counter-demonstrators, killing one women and wounding 40 others. According to Shekhovstsov, beginning in 2014 RIM was active behind the scenes in Russia's war on Ukraine. RIM leader Vorobyov arrived in Ukraine shortly after the arrival of Moscow's "little green men"—Russian special forces troops operating without formal military insignia that took over Crimea in 2014. 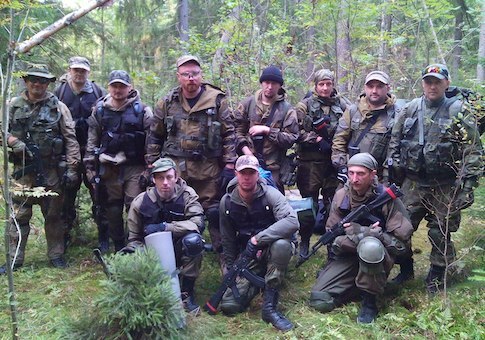 The Partisan course offered by RIM offered basic military training for Russian "volunteers" who traveled to Ukraine. The group claimed it trained and dispatched over 300 volunteers to eastern Ukraine. Vorobyov told the Free Beacon in an email that in the past the Russian Empire was sympathetic to the United States and helped the U.S. in the war of independence. "In case of the victory of the Russian Imperial Movement in Russia, we will return independence to our country and we will certainly establish the best relations with the United States," he said. "Of course, we also sympathize with all conservative and traditional political forces both in the world and in the USA," he added. "We believe that the United States must return to traditional Christian values in order to remain a sovereign state. The United States should not sacrifice itself to international capital in favor of Great Britain and drag its chestnuts out of the fire for it, spending its own budget on the interests of Great Britain." This entry was posted in National Security and tagged FBI, Russia, Terrorism. Bookmark the permalink.